It was a night of miracle and wonder as two of the world’s top artists shared a stage under the stars in a concert that often soared to magical levels. A sell-out audience paid up to $500 a ticket to see Paul Simon and Sting perform their - and each other’s - enduring songs at Sir James Mitchell Park. Early in the set the mutual respect between the pair was obvious as they launched into two of their timeless classics, sharing lyrics and bouncing off each other during Simon’s Boy In The Bubble and Sting’s moving Fields of Gold. 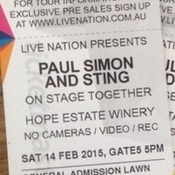 But it was their interpretations of each other’s songs that made the night so memorable, first with Simon’s take on Fragile, followed by Sting (aka an Englishman in South Perth) returning the favour on America. Hearing two of the most iconic voices of the past half century reimagining each other’s work made for a inspired partnership. Among the largely middle aged crowd was WA mining billionaire Andrew Forrest and Federal Justice minister Michael Keenan. The concept for the Together On Stage tour dates back to 2013 when the long-time friends and New York neighbours first performed as a duo for a benefit concert. Strolling on to the stage, the mega-star double act at first make for something of an odd couple, with Sting, a 63-year-old Englishman with the physique of an athlete, towering above Simon, a 73-year-old trilby-wearing American. While their successes peaked in different decades and in different genres, the pair of course find symmetry with their experimentation with world music, from The Police’s reggae-rock to Simon’s Zulu harmonies. For almost three hours, the duo delved into their vast back catalogue, delivering crowd-pleasing mini-solo sets and merging bands to duet on each other’s hits and perform versions of one another’s songs. Tickets are still available for tonight’s second and final Paul Simon and Sting’s Together On Stage performance at Sir James Mitchell Park.